Our first stop on the South Island of New Zealand was a town called Kaikoura. It’s on the east coast and is famous for whale watching. But we stopped there to go see some albatrosses. Neither Beth nor I had ever seen an albatross, and this is one of the few places in the world you can be pretty sure of seeing several. 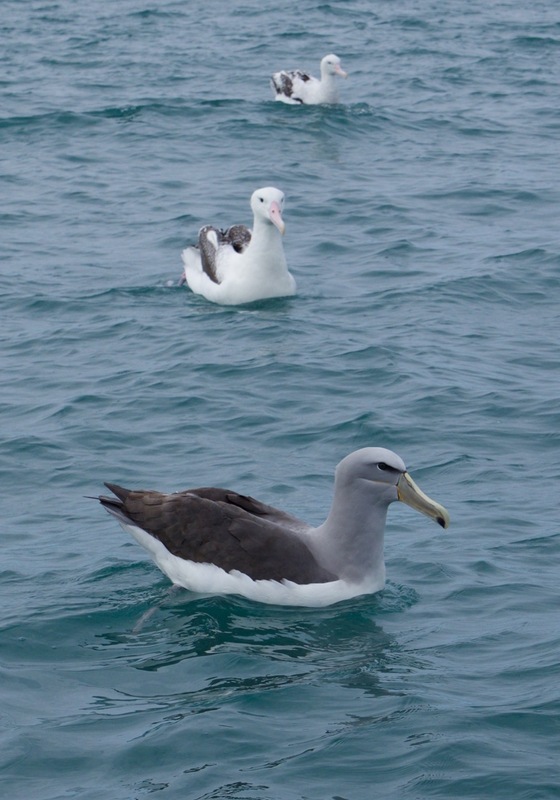 There’s a thrice-daily boat tour called Albatross Encounter, and we signed up to go in the morning session. The tour ended up being five guests and one captain/guide. A family of four had signed up to join us, but when they didn’t show up on time we left without them. The boat captain used to be a fisherman in the area, so he knows the area, knows boats, and also knows the wildlife. 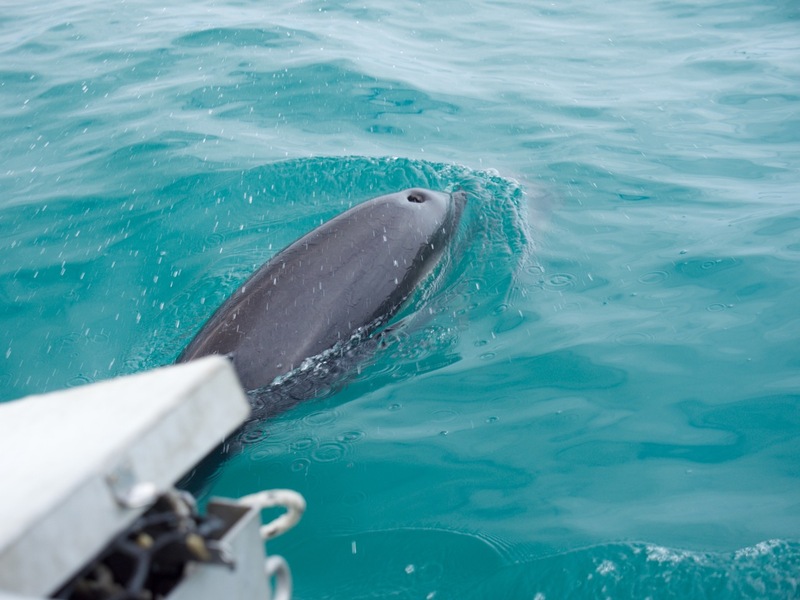 He took us out about 15 minutes from the harbor, and then we started seeing animals galore. As we spotted something new, he would dutifully write it down in his log book. Later in the day when we returned to shore, he entered all the data into the company’s database so they can track what was seen, and where. But he also gave us a photocopy of his log so nobody had to try to jot everything down; we could just watch the animals. 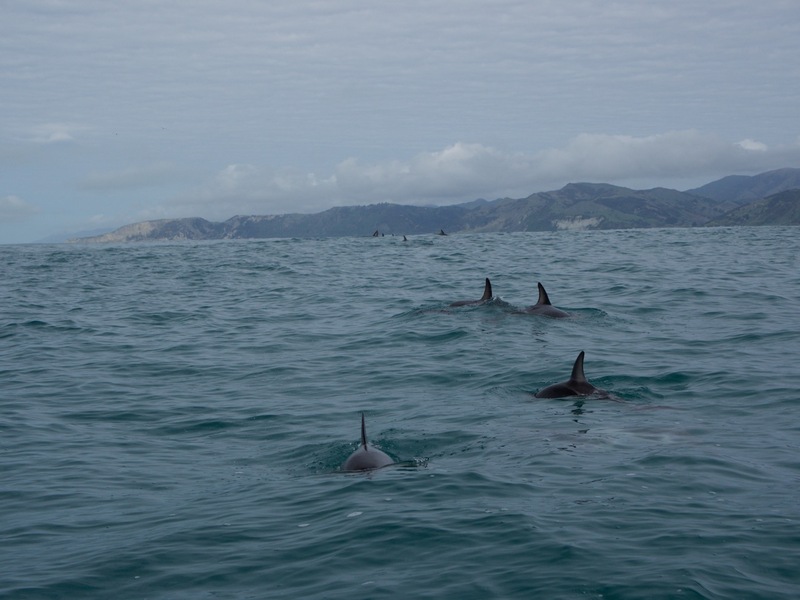 We saw four species of albatross, several other species of birds, two species of dolphin, and some seals. But we didn’t see any whales or penguins, unfortunately. To make extra sure we would see the birds we paid a lot of money to see, he brought a big frozen block of fish parts to chum the water with. He threw that out in a heavy duty net and let it float behind the boat. The birds swarmed on it. Then when it was time to go to another location, he’d pull what was left back in and move the boat, then throw out the block of fish parts again. At the last birding stop of the morning, he opened the mesh bag and left the remains of the block behind. As the boat drifted apart from the frozen fish, the birds attacked the block with even greater gusto. We didn’t do a whole lot else in Kaikoura other than relax, catch up on photos and writing, and spend a lot of money at restaurants. It’s not a big town, but our bungalow was on the outskirts, which meant for lots of walking. Great photos. Love those albatrosses and other birds. Looked like lots of shearwaters as well. Doubt if I’ll be able to ever take a birding trip that far away, and I wasn’t in to birding when we spent a few weeks in NZ some years ago.